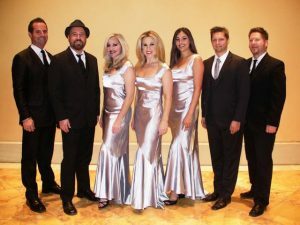 Las Vegas show bands are premier corporate dance groups that double as high-end wedding dance bands in the U.S., Canada and other international destinations. They have years of experience performing at award dinners, conventions, trade shows and other corporate events as well as high-end weddings. We work with event planners, wedding planners and dmcs from around the world on their clients' events and those planners and clients love our bands! We're describing the elegant presentation, high level of performance and multi-style abilities of these special 7-piece-and-larger groups and not necessarily their location. Most of these groups are based in Southern California. We have one high energy Las Vegas-based group (a 6-piece) but they aren't listed on this site. With changes to the industry since 2007, fewer and fewer quality cover bands are available today. Of those that are still performing, we believe we have the very best to offer our clients. The key to these groups’ longevity is keeping their performances at a high energy level, staying “current” song-wise and keeping their front lines young. They can do costume changes between sets and specialize in performing at themed events. Two of these groups perform "decades shows" in lavish costumes followed by dance party sets. They can also provide choreographed dancers as per the client’s request. Some of these groups perform "continuous music" with extra musicians to "break" key musicians. If you're looking for highly entertaining Los Angeles wedding dance bands or Los Angeles corporate bands that feature outstanding vocals, vocal harmony, "A"-level musicians--groups that performs 90-minute dance sets or continuous music--then one of our DLE Las Vegas show bands is for you! Some of these groups prefer bringing their sound techs with them when they travel, others don't. Some bring production assistants to their large-band performances while most of the other groups don't. Previous day arrival requires per diem or other compensation and is preferred when flying in entertainment from another state or region. Song lists, tech riders, input lists and stage plots are available for all DLE groups. For a detailed description of the differences between cover bands and other bands as well as other important information on our entertainment, please visit our FAQ page. DLE Las Vegas bands like to travel and are available not only in Las Vegas and Los Angeles but also in San Francisco, San Diego and across the continental U.S. and Hawaii as well as worldwide. Press the "Request a Quote" button for a price quote on one or more of these terrific groups and we will email you their tech rider, play list and video links if not seen here. We have other cover bands not shown on this page available for corporate events and wedding receptions. 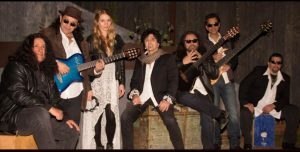 Headliner Terry Ilous (Great White, XYZ) has a sizzling new Rock/Latin/flamenco fusion band–Terry Ilous and The Vagabonds. A 6-piece corporate show band with two percussionists, Terry’s group is exactly as he describes it–“Led Zeppelin meets The Gypsy Kings”! Terry Ilous is the consummate vocalist-performer. 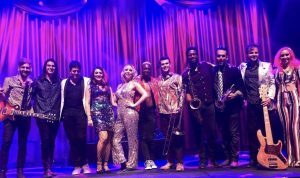 The S Band (a 6 to 9-piece) is a high energy dance party group that features some of America’s most talented performers and musicians including a dynamic vocalist duo up front. Their past clients include ESPN, ABC News, Usana and many more. One of the top corporate event entertainment bands on the East Coast, The PS Show Band is an 8 to 12-piece, high energy, multi-faceted group that performs a Rock Legends Show (they are terrific sound-alikes) along with continuous music, mixed cover performances involving audience participation and instrument exchange. One of the great high energy show bands out of Southern California is The RG Show Band (8 to 14-piece). The 8-piece features male and female front-line vocalists, a second percussionist and one horn; the 9-piece features a second horn, the 10-piece a second male or female vocalist, etc. 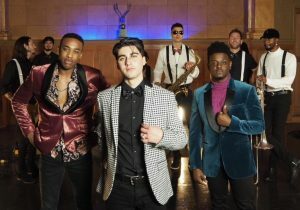 When we added WQL (an 8 to 14-piece with one highly-active male vocalist and two to three female vocalists) to our site, we noticed an immediate increase in client interest in this page. They are one the few quality groups that will drive to Las Vegas from Southern California, saving our clients money on what is often a deal-breaking issue. The BH Show Band (a 5 to 11-piece) is our newest high energy corporate cover group specializing in Top 40 dance hits as well as 80s covers. 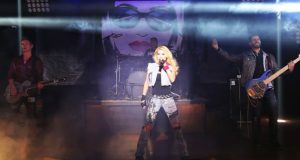 For corporate event entertainment or wedding reception bands, the 5-piece powerhouse The DLE Las Vegas 80s Tribute Band is THE top 80s tribute group in America providing our clients with a dazzling, fun, high energy dance extravaganza! A terrific audience participation group, they’ve performed at many events in the Los Angeles area.